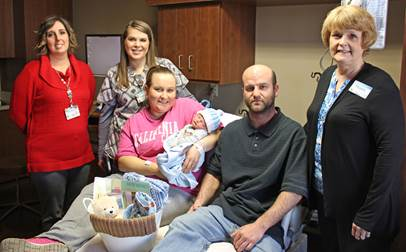 Congratulations to Stephanie Austin and Curtis Davidson of Enterprise who delivered the first baby in 2018 at Memorial Hospital in Abilene. Kaesen Davidson was born on Thursday, January 4, 2018, 11:55 a.m., in the Birthing Center at Memorial Hospital. He weighed 7 pounds 8 ounces and was 19 ½ inches long. Kaesen joins his sister Madelyn at home.